Mass hysteria on the part of the Democrats, neocons, ultra-liberals and plain and simple Russophobes, was provoked by the recent statements of Donald Trump. Speaking at a press conference in Florida, Trump called on Russia to hand over the 30,000 emails "missing" from the Hillary Clinton's email server in the US. Their absence is a clear sign that Clinton destroyed evidence proving that she used her personal e-mail server to send sensitive information. Democrats immediately accused Trump of pandering to Russian hackers, although in reality the multi-billionaire rhetorically hinted that the data that Clinton hid from the American investigation is in the hands of foreign intelligence services. So, Clinton is a possible target for blackmail. Trump's statement that he is ready to discuss the status of Crimea and the removal of anti-Russian sanctions caused even more noise. This view is not accepted either in the Democrat or in the Republican mainstream. Trump also said that Vladimir Putin does not respect Clinton and Obama, while Trump himself hopes to find a common language with him. Trump appreciates Putin's leadership and believes that the US must work together with Russia to deal with common threats, particularly against Islamic extremism. Both Democrats and Republicans are taking aim at Trump. The vice-presidential candidate, Mike Pence, made threats to Russia. The head of the Republican majority in Congress, Paul Ryan, became somewhat hysterical. He said that Putin is "a thug and should stay out of these elections." It is Putin personally, and the Russian security services, who are accused of leaking correspondences of top employees of the National Committee of the Democratic Party. This unverified story united part of the Republicans and all of the Democrats, including the Clinton and Barack Obama themselves. Trump supporters note that the Russian threat is used to divert attention from the content of these letters. And these show the fraud carried out during the primaries which favored Hillary Clinton. 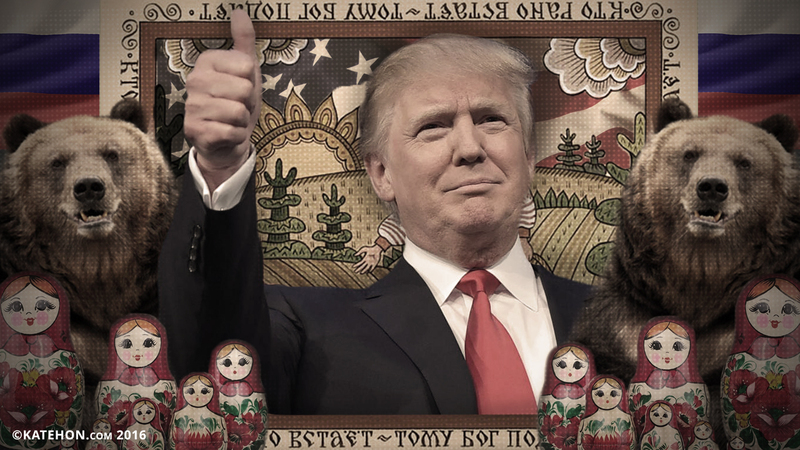 The "Russian scandal" demonstrates that on the one hand the thesis of the normalization of relations with Russia, despite the propaganda, is becoming popular in US society. It is unlikely that Donald Trump has made campaign statements that are not designed to gain the support of the public in this election. On the other hand - Trump - a hard realist, like Putin, is not pro-Russian, but a pro-American politician, and therefore the improvement of relations with Russia in his eyes corresponds to the US's national interests. Trump has never to date done anything that would not be to his advantage. Sometimes he even said he would order US fighter jets to engage with Russian ones, and declared he would have a hard stance in relations with Russia. Another thing is that his understanding of US national interests is fundamentally different from the dominant American globalist elite consensus. For Trump, the US should not be the source of a global liberal remaking of the world, but a national power, which optimizes its position just as efficiently as any commercial project. And in terms of optimizing the position of the United States, he says there should be a normal American interaction with Putin and Russia in the field of combating terrorism and preventing the sliding of the two countries into a global war. He claims this is to be the priority instead of issues relating to the promotion of democracy and the so-called fight against "authoritarian regimes".